My wife and I just recently closed on our first home. The home was built in 1930 and aged excellently. The couple who we bought the home from had purchased it as a foreclosure in 2006 and made it their retirement project to completely restore the place; they did a wonderful job and covered almost everything. Before getting to the question; there are no visible signs that the water heater is going bad. It's a 240V electric water heater with two 4500 watt elements. It's still capable of pumping out crazy hot water (I need to turn the temperature down I believe). Without looking closer at it and it's tags, I never would have guessed, but it was installed in March of 1984 - it's almost a 32yo heater. Everything I've seen and heard says that most heaters only last half of that time. The other thing that might affect it, is that it was winterized in October of 2004. Our guess is that it was cleaned out then and that extended it's life, but I'm unsure. They all eventually wear out, I'd just like to know what the thought is on this and if we should bite the bullet and be looking for a new one before it goes. Oh and my other thought is what this could be doing to our electric bill. I'd take the guess of course that the newer ones are all more energy efficient and we'd be saving some money there to make up for it. We also have natural gas to the house; I believe we'll go with a gas heater next time around from what I've heard, but I'm not really sure if it saves much money there either? Didn't read the tag correct before now.. it's it least $800 a year or about $65 each monthly power bill. I think it'd definitely pay for itself to replace it. From what I've seen, the models today are more like $500 a year. That's $25 saved per month. 1984! You are now the proud owners of a historic landmark! Many circumstances effect how long a water heater can last. The maintenance it was given (as you suggested), but mostly what material was used and their quality to manufacture the parts are the surest way to predict the lifespan of any product. You also heard correctly; at the very most todays mid-priced tanks will only perform for 10-12 years (possibly a bit more) before the tank rusts through or the valve stops functioning (the two problems commonly making a homeowner purchase a new one). Presently you will only find high efficiency tanks for purchase. Long gone are the standing pilot light gas burner, replaced by a push button Piezo ignitor. The electric models haven't changed much overtime. All types have increased in price though (substantially!). It has been my understanding that when selecting a new tank you should select the best model that your budget allows. Also remember that gas fuel is less expensive than electric (unless you have a PV array spinning your meter backwards). To sum up , although your tank is functioning as it should it is well into it's golden years. It would be wise to seriously start looking and considering what type of tank is going to replace it. 1984! Would you please post a picture for posterity! Some of my co-workers won't believe me! Newer water heaters do not last as nearly as long as they used to. Nowadays, you are lucky to get 10 years out of one. This is due to the way they are manufactured. There are still some water heaters around that are from the 1960s that work perfectly fine. The tanks on some of those heaters are made out of copper, and won't corrode like modern steel tanks. Your tank most likely has replaceable sacrificial anodes in the tank. These anodes will corrode instead of the walls of the tank. The life of your heater will be much longer if the anodes are maintained. These are fairly universal, so you should be able to find ones that are compatible. The anodes should be inspected or replaced at least every 5 years. The newer heaters do offer an energy savings, and some of them have a programmable timer on them which can turn down the temperature at night, and when you are away. They are also better insulated, so there is less heat loss. You can purchase a water heater blanket which will add an additional layer of insulation to the tank. As long as there aren't any signs of failure on the tank such as rust spots, etc, then you should be good to go. Just as a warning, tanks can fail suddenly, and without warning. A leaking water heater could potentially flood your entire basement. There are water leak detection alarms on the market that are inexpensive which set off an alarm similar to a smoke detector if a leak is detected. It would be a good idea to install one just in case. Even newer water heaters can fail, so it is actually a good practice to have one of these alarms for any water tank installation. Electric resistance water heaters are only slightly more efficient (better insulation is the only reason) now than they were then. From that point of view you could apply an insulation overwrap and be money ahead. If the tank is solid and you check and/or replace the anode regularly (and flush the bottom) to keep it that way, you may simply be benefitting from favorable water chemistry and/or careful prior owners. 32 years is an awfully long time though, so some peace of mind might come with a new one. Heat pump water heaters are significantly more efficient than pure resistance electric water heaters, but also significantly more expensive, though that can be offset by rebates in some areas. Depending on the relative prices of electricity and natural gas, and availability of gas at your house, it either does or does not make sense - there is no single answer for that. The logical appeal of tankless units is offset in practice by how low the "standby losses" of a well-insulated tank unit actually are, and the additional complexity (= ability to go wrong) of control system and sensitivity to water chemistry (scaling, perforation) the tankless heat exchangers represent. Many people who installed one when they were at peak popularity have not really seen much payback, since most of the heat going into a tank unit with regular use comes out as hot water used, and there's no fuel savings on that. You can't really know what "winterized" meant. But, to last that long the water is either very low in minerals or the anode rod has been changed out regularly...any water heater can last forever if the tank is kept protected from the inside. Gas isn't any bargain over electric (in my area) & you need both a chimney of some sort & the gas plumbing. I think it was April of last year that all water heaters are now much better insulated, so a new one would be a big help. Marathon tanks aren't steel so they're top of the list for longevity. Measure for a new one's fit before you decide on a new one, vertically & horizontally. Newer water heaters can be substantially more efficient, both in terms of heating efficiency and thermal loss through the tank walls. It might be worth replacing it for that reason alone, though payoff will be in years, not months. I'd install a direct-vent gas unit, personally. They're more efficient, and turnaround time is much better. You'll almost never encounter a situation where the second or third person to shower gets the cold shoulder. Regardless, water heaters should be flushed annually to remove sediment, etc. There are plenty of how-tos to be found for that. I would carefully consider where the water heater is located within the house. In both the houses I have owned (build dates of 1985 and 1912), the water heaters were installed in unfinished basements. Over the course of time, both of these water heaters failed and sprang leaks. Fortunately in both cases, the leak water simply drained away without causing any damage other than the inconvenience of a damper than normal basement floor (dirt, covered with plastic sheeting). Had these water heaters been installed in an attic or upstairs closet, the water damage would likely have been far more significant. This tank is certainly a veteran! I'd have it flushed and the anode rod checked -- if more than 6" of bare wire core is visible, then you should start considering a replacement water heater. If the anode's still OK and the tank isn't rusting, I'd retrofit the tank with a curved dip tube and ball drain valve (if that hasn't been done already), throw a fresh anode in there, and be good for another 6-12 years (or more!) until the next anode change. Assume you're going to live in the house for several years. Assume that a water heater that old is getting closer and closer to it's end of life. Assume you're going to have to replace it anyways at some point. Given all of that, you can choose to replace it before something goes wrong, or after. The catch with the latter is that when a water heater dies, it can cause a lot of damage (if it's a leak) or a lot of cost (if it's a holiday and midnight and your really need hot water for your in-laws that are visiting). So I would strongly recommend you replace it now. 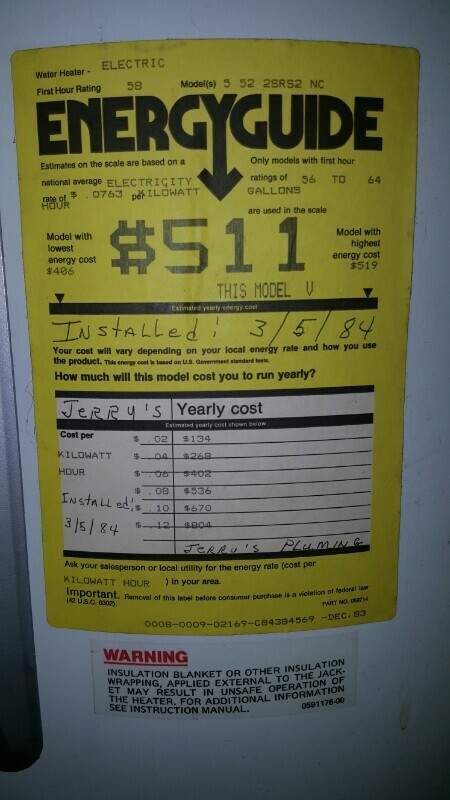 Furthermore, as stated a water heater today is going to be more efficient, so will save you some money there. If you convert to a new technology, such as a heat-pump water heater, it may be a lot more efficient. And a big bonus is that your utility may offer rebates for you if you replace it. Around here, I was able to replace my water heater essentially for free with a combination of a sale at Lowes and a big rebate check from the utility. Our water tank/heater was fitted in 1968 and the previous owner didn't even switch it off once in the past 27 years. Still get piping hot water even after 6 people showering so I'm loathe to replace it with an undoubtedly inferior modern equivalent. The tank is in a drained basement so no biggie if it does leak and on that basis I'll not replace it until it fails. I'd suggest you do the same as recovering the installation costs of a new unit through potential energy savings is a dodgy calculation at best. Not the answer you're looking for? Browse other questions tagged water-heater or ask your own question. Are my heat pumps using the right amount of power? Why is my new water heater making a clicking noise? What is the proper way to clean a water heater? 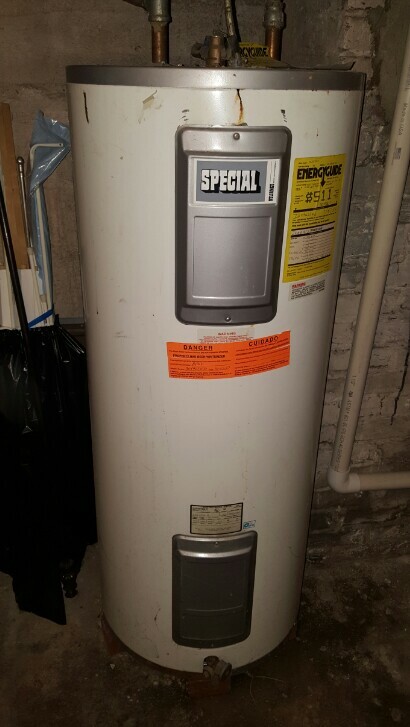 How can I go back to a gas water heater? What are the signs of a failing tank water heater?